Online content on its own, however interesting, informative or attractive, is as static as a poster on a wall. It will attract attention from people who pass, who might tell other people, but the impact of the work you have put into developing and posting your content - often quite a lot of work - will be a fraction of its potential unless you put as much effort into promoting and spreading the word. After our first social media training workshops at FAO in July 2012 we developed a new metaphor to try and communicate both how this can happen and the value of the random connections which fuel social media communications and very, very rarely, make content go viral. During the second workshop at FAO last week we introduced the new idea, using a natural metaphor since, as ever, nature got there first. With some trepidation, to an audience composed mainly of scientists, we talked about the role of bees in pollination. 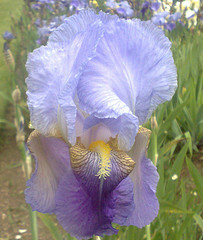 It was an excuse to show nice pictures of flowers - always good after lunch - which can represent an individual content object - a photo, video, blog or tweet. Flowers have evolved a variety of mechanisms to attract the insects they need to reproduce - colour, shape, smell, location and their structure, making it easy for bees and other insects to visit, collect nectar and pass on. In the same way, content needs to use all the tricks of the trade to stand out from the crowd. As well as the normal techniques for making the content communicate, these days that means ensuring that 'share this' buttons, or the equivalent, are prominently displayed - like the landing stage of the flower (see the bottom of this blog post). The second element in the metaphor is the pollen that collects on the bees as they go from flower to flower. 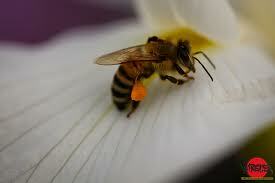 Randomly, unaware of their central role in passing on genes, the bees transmit the pollen from one flower to another. The parallel with social media is, we hope, obvious: the famous - and very shaky - claims that a tweet reached n1000 people operates on the same principle. If someone re-tweets one of my tweets then all of that person's followers will see it and, in the random way that tweet-viewing works, a tiny fraction of them might spot something in the second that it scrolls by and pass it on, and so on. To enrich the metaphor, bees go back to their hives and communicate the location of the flower. I was startled that this amazing piece of scientific decoding wasn't universally understood. At the risk of stating the obvious, as these pictures below show, patient scientists observed and decoded the movements of bees returning to hives and recognised that they were communicating direction and distance through a precise set of dance moves (well, sort of dance moves, of a bottom waggling kind). Other bees set off to the same spot, and so the cycle continues. Again, we hope the link to social media is clear: adding a link to a tweet, or mentioning people in a blog, or tagging a photograph is doing the same thing as the bee dance: telling our hive - followers, friends, readers - precisely where this good smelling, tasty, bright content object can be found. And in the wonderful way of the world, bees also turn the nectar into honey, which is harvested across the world by animals and humans. Without being too fanciful about it, this can be seen as analogous to the way that learning and knowledge spreads and is shared, where other people's ideas and learning help us manufacture something that is both new and made up of millions of ideas from other people, places and times. It's always good when you arrive at a point and see the marks that show someone else has passed this way. I learnt that Peter Casier has developed a similar metaphor in his work for CGIAR on social media strategy. Peter uses the metaphor of candy and shops, where the research item is the candy, the site the shop, and the social media task is to go out and spread the word - through tweets, blogs etc. We must both have a sweet tooth.